Pakistan's new prime minister was sworn in by President Pervez Musharraf on Tuesday, a day after challenging the US-backed leader's authority by freeing judges he detained under emergency rule. Yousuf Raza Gilani, a senior member of the party of slain opposition icon Benazir Bhutto, was elected as premier on Monday by parliament, where an anti-Musharraf coalition won a majority in elections last month. Gilani spent five years in jail under Musharraf's government, but on Tuesday found himself taking the oath as prime minister from the former military strongman, who seized power in a coup in 1999. Chants of "Long Live Bhutto" briefly erupted in the audience after Gilani, dressed in a black traditional sherwani outfit, finished repeating the oath read out by a grim-faced Musharraf. 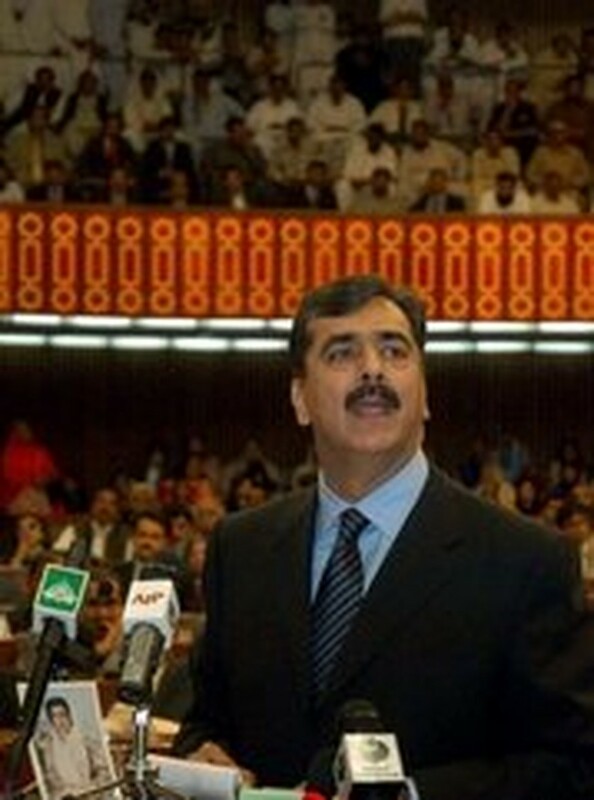 Neither Musharraf nor Gilani gave any speech after the five-minute ceremony at the presidential palace. The ceremony came as US Deputy Secretary of State John Negroponte and Assistant Secretary of State Richard Boucher arrived in Pakistan for talks with Musharraf, Gilani and former premier Nawaz Sharif, officials said. Both Pakistanis and Western allies are watching to see how strongly the Gilani-led coalition government will confront Musharraf, a bulwark in the US-led "war on terror". Minutes after being elected on Monday, Gilani ordered the release of the chief justice and other judges who have been held since Musharraf sacked them in November amid fears they could weaken his grip on power. Deposed chief justice Iftikhar Muhammad Chaudhry was meeting senior lawyers and well-wishers on Tuesday, after finally emerging from four months of house arrest the previous night to wave to ecstatic supporters. The coalition, led by Bhutto's Pakistan People's Party and including Sharif's party and two smaller groupings, has vowed within 30 days to pass legislation reinstating the sacked judges. Musharraf imposed a state of emergency on November 3 and sacked some 60 judges including Chaudhry when it looked like the Supreme Court might overturn his October re-election as president. But the president's position has been badly weakened by the heavy losses suffered by his allies in last month's polls, coupled with plummeting popularity and economic problems including growing power cuts. If the judges are reinstated they could rule his re-election as president illegal, causing further instability in a nuclear-armed state that has been plagued for months by violence blamed on Al-Qaeda and Taliban militants. Musharraf on Sunday pledged his full support to the new coalition, hailing the start of what he called a "real democratic era" in the country, but analysts said Gilani's opening gambit spelt trouble for the president. "This is the worst nightmare for the presidency. This is the worst dream they would have imagined coming true," newspaper columnist and political analyst Ayaz Amir told AFP. Amir said that after freeing the judges, the new prime minister and government would come under pressure to reinstate them. "Gilani got the loudest applause in parliament when he said he would free the judges. It was louder than when he said parliament would demand a UN investigation into the assassination of Benazir Bhutto," Amir said. Bhutto was killed in a suicide and gun attack at an election rally in December.